Savannah monitor in his burrow. Two feet of moist sand/soil substrate in an 8x4x4 enclosure is the recommended habitat for this type of monitor. The Savannah Monitor (Varanus Exanthematicus) or Bosc Monitor are native to the savannahs and grasslands of Africa. The misconception that they are desert lizards often causes them to be housed incorrectly. The region of Africa where they are commonly taken from has an average relative humidity of 80% and this needs to be taken into consideration when providing a habitat for your savannah monitor. The general housing requirements for an adult savannah monitor are 8 feet tall by 4 feet wide by 4 feet deep, or twice the length and 1-1/2 times the width of the monitor. Often 6x3x3 is also sufficient depending on the size of the monitor. Savannah monitors are excellent escape artists and this should be kept in mind when building their enclosure. A young or hatchling savannah monitor can be kept in a glass enclosure with a locking screen lid until he reaches about a foot in length, at which time a larger enclosure will be necessary. Often dubbed 'lazy' the savannah is actually quite active and will explore his home when kept properly warm. The idea substrate for a savannah monitor is 1-2 feet of sand/soil mix, with 2 feet being ideal, as they will thermoregulate inside deep burrows that they dig. This substrate and burrows are necessary to provide adequate humidity and moisture and to prevent internal dehydration from breathing dry air. Savannahs are diurnal lizards, meaning they are awake during the day and sleep at night. A 12 hour light cycle is recommended year-round. If night time heat is needed, use a ceramic heat emitter as the heat source as it gives off no light and will allow your monitor to receive proper heat without disturbing his sleep. The monitor should have a hot basking area on one side of the enclosure, and a cooler side on the opposite side to allow him to thermoregulate. The basking spot should be rather hot, between 100-130*F with 120*F being the average for most keepers. The ambient temperature of the tank should be between 85-95*F, and the night time temperature should not go below 70*F.
There is much debate as to the need for UVB in captive savannah monitors, and studies have not shown that these monitors suffer any problems from not having UVB. Please do your own independent research to determine if you would like to keep your monitor under UVB. There are no ill effects reported from having UVB, and many sources say they 'benefit' from UVB. Many keepers who have their monitors under UVB will change the bulb every 12 months, as opposed to every 6 months recommendation for most basking lizards. There are links to care information on this page that can help you make a decision for your own monitor. Mr. Chub Chubs, savannah monitor. This photo and the header photo are courtesy Kayla Goldberg, North Bay Tegu and Monitor Rescue. Savannah monitors can live up to 30 years, and a varied diet is important to their long term health. Up until they reach 3 feet in length, the monitor should be fed daily to encourage proper growth, but realize that obesity can be a problem with monitors in captivity, and the feeding schedule should be altered accordingly. Feed whole prey items only: roaches, mealworms, grubs, nightcrawler earthworms, crickets, hornworms, silkworms, snails, prawns, crawdads, crab - any whole prey invertebrate/crustaceans. Treats or rarely fed items include quail, chicks, whole fish such as sardines or silversides, and rodents and eggs with last priority. Everything should be raw and nothing cooked. Occasional supplementation with reptile multi-vitamins and calcium should be given in addition to a varied diet. Be sure to provide a water dish large enough for your monitor to take a swim, and change it daily. Savannah monitors will often defecate inside of their water so it is important to check this and keep it clean. While monitors kept at the proper temperatures are rarely 'puppy dog' tame, you can have a relatively tame monitor with patient, quiet handling and trust building. Captive bred savannah monitors are much easier to tame than wild caught, so it is important to consider the source of your new monitor. Cold monitors are extremely docile, so in purchasing a new monitor, make sure you have the opportunity to see and handle it when it is at the proper temperature to avoid surprises with the temperament later. If you are one of those people who house your Savannah Monitor on wood chips instead of two feet of moist sand/soil substrate, read this article and realize your monitor is dying a slow death from internal dehydration. A MUST READ. Direct link to RepticZone's Monitor Forums, a really great place to network with other monitor owners, ask questions, and find out what issues other monitor keepers are having. Facebook group dedicated to the proper keeping of varanus monitors. All aspects of husbandry are covered in their brilliant docs. A must join group for the monitor keeper. Another page explaining the importance of proper enclosure and keeping of the savannah monitor, focusing on the preventable disease Gout. Monitor-lizards.net is a great site which goes into detail regarding natural climate, conditions and diet of most species of monitors. 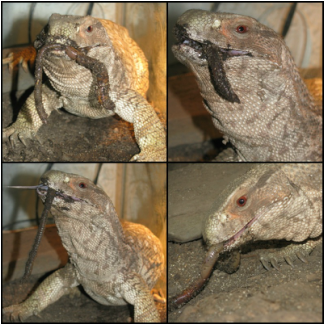 North Bay Tegu and Monitor Rescue website has solid care information.